Q10 goes by many different names and abbreviations - some of which are misspelled. You can therefore risk being uncertain about which type of Q10 you is dealing with when you encounter one of the many names of the substance. 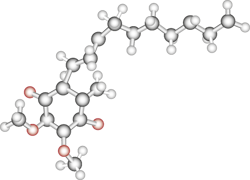 An illustration of the Coenzyme Q10 molecule showing the quinone head and a part of the much longer long tail with 10 isoprenoid units. The process by which the nutrients are converted into energy is called the energy metabolism. Coenzyme Q10 plays a central role in this complex biochemical transformation. 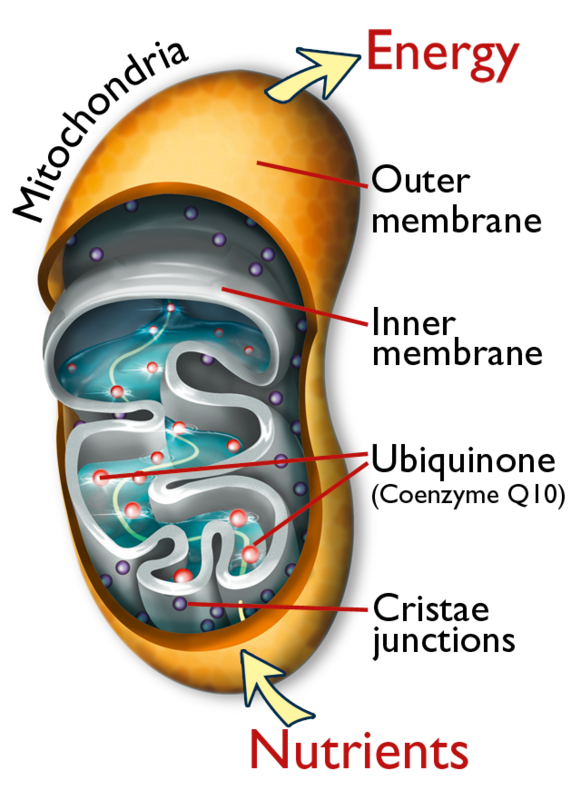 It is active in the inner mitochondrial membrane where the Q10 substance is necessary to control the synthesis of ATP. A human being cannot live without Q10. A total absence of Q10 would mean the end of our cellular metabolism resulting in instant death. A partial reduction in the rate of Q10 synthesis and absorption would lead to a significant loss of energy. Documented cases of fatigue and muscle pain have been observed in patients treated with cholesterol-lowering drugs that are known to decrease the body’s synthesis of Q10.